In 1926, Walter Killough established the Killough-Hullum Funeral Home on the corner of 5th and Jefferson Street in Elk City. W. Alfred Martin was employed two weeks later and became the general manager and Co-Owner in the late 30’s. In 1942 the funeral home was moved to the corner of 3rd and Washington in the O.H. Young home. This building was remodeled and the Martin-Hullum Funeral Home operated there until1951 when Norman Martin purchased the Hullum sock and the business continued as Martin Funeral Home at 3rd and Washington until 1963. In September of 1963 the O.H. Young home that was the funeral home was moved to the corner of Pioneer and West Third Street. 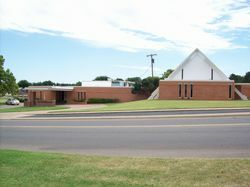 A short time later the former Martin Funeral Home building was purchased by the City of Elk City and establishment of the Old Towne Museum began. Alfred Martin and his son Norman Martin constructed the Martin Funeral Home at 600 West Country Club Blvd. in 1963 and has operated in that location since. Historically, W. Alfred Martin began his career in the funeral service industry in 1926 and co-owner manager until 1981 when his health would not permit him to continue. During his fifty-five years of service in the funeral profession he was elected to serve a term as president of the Oklahoma Funeral Directors Association. Norman Martin began his career in funeral service in 1945, and graduated from the Dallas Institute of Mortuary Science in 1951. Norman, served as a member of the State Board of Embalmers and Funeral Directors for twelve years and was also elected President of the Oklahoma Funeral Directors Association in 1981. Alfred and Norman were both born in Elk City and have served as Elk City Funeral Directors continually longer than any other funeral concern in Beckham County. Craig Martin returned home to Elk City in 1985 to join the family business as the general manager and pre-need counselor. Craig was primarily in charge of day to day operations of the funeral home. Craig’s younger brother Kevin Martin returned home 2001 to assist the family with the funeral home. After Kevin returned home he attend and graduated from the University of Central Oklahoma in 2002 with a degree in Mortuary Science. Kevin, is a licensed funeral director and embalmer has been working side by side with his brother Craig to continue Martin Family tradition. To honor the Martin Family and their over eighty eight years of service to the community, the name of the Funeral Home will not be changed but rather altered just a bit to include our family name along with theirs. The name of the funeral home will be Martin-Dugger Funeral Home. Richard L. Dugger II, CFSP is a native of Elk City, Oklahoma. He is the son of Richard L. Dugger and the late Patricia Ruth (Binyon) Dugger. He and his wife, Tammy have four children, Zach Rowland, Radek Dugger, Lex Dugger and Elizabeth Dugger all of Elk City. We are truly grateful to the Martin Family for honoring our family by entrusting us with their families business. It is an honor for us to receive the trust, tradition and family heritage of over eighty-eight years of services to the families of Western Oklahoma. It is our desire to continue to serve the families and communities in a compassionate, professional and caring way that they have grown accustom to and deserve.